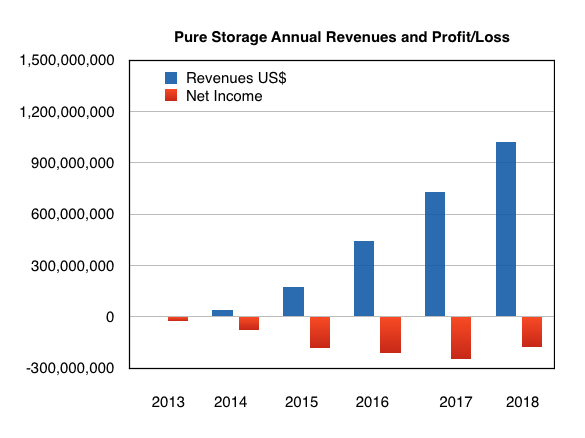 Flash array shipper Pure is now officially a billion-dollar turnover organ and appears poised to finally reach profitability as competition from Dell EMC and HPE contines to wane. For Q4 ended 31 January 2018, revenues were up 48 per cent year-on-year to $338.3m, jumping 34 per cent up on the previous quarter in a seasonal end-of-fiscal-year surge. Product and services sales grew at 48 per cent each to $277.4m and $60.9m respectively. Some 76 per cent of sales were generated in the US and the remainder from ops spread across the rest of the globe. With this much reduced loss in the latest quarter we might see Pure's first profit during the coming quarters. Humble-bragging Pure CEO Charlie Giancarlo claimed it was nearly two decades since an independent IT biz "reached this revenue scale. We have achieved the $1bn milestone in just over eight years since our founding". Pure president David Hatfield noted the "increase in win rate across all of our competition." There were 500 new customers in the quarter, taking the total count past 4,500. According to Wells Fargo senior analyst Aaron Rakers: "IDC estimates Dell EMC all-Flash revenue was -13 per cent yr/yr in C4Q17. 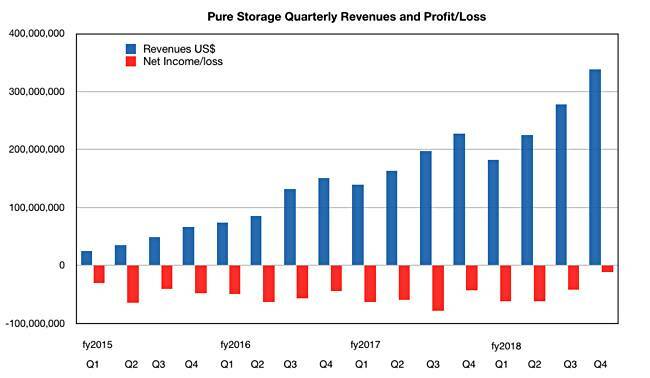 "We estimate all-flash VMAX revenue down 16 per cent yr/yr (XtremIO -36 per cent yr/yr); market share at 29 per cent in 4Q17 vs. 38 per cent a year ago." We also know HPE all-flash array sales grew a relatively paltry 16 per cent in its latest quarter. Rakers said: "HPE's [AFA market] share of 12.5 per cent was down from 14.4 per cent a year ago – momentum from all-flash Nimble (+112 per cent yr/yr in 4Q17) offset by weakness in all-flash 3PAR (-3 per cent yr/yr)." 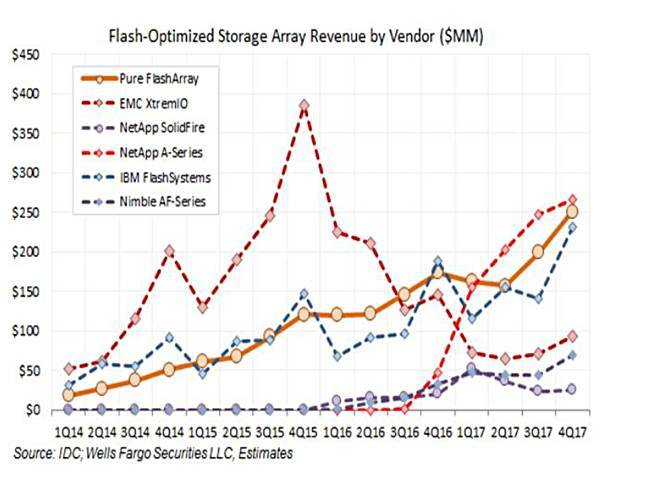 The chart shows three strong risers – NetApp's all-flash FAS, Pure's FlashArray, and IBM's FlashSystem. Dell EMC's XtremIO is the big faller, although picking up slightly in the last couple of quarters. HPE Nimble's AF is in the same revenue area now, and also rising, while NetApp's SolidFire trails the pack. He doesn't have HPE 3PAR on this chart. Hatfield mentioned FlashStack in the earnings call: "FlashStack momentum has also remained strong, with presence now in more than 30 countries. Growth for this joint solution with Cisco has significantly outpaced the overall converged infrastructure and integrated systems markets." He praised FlashBlade, its massively parallel architecture and its rapid restore capability, but released no numbers: "FlashBlade had a very good year and finished with a great Q4." Pure's headcount passed 2,100, growing by some 400 souls during the year.